Photo by Marion S. Trikosko. As of last week at the APA Convention in Hawaii, I assume the duties that come with the office of President of the Society for Humanistic Psychology—Division 32 of APA. The theme of my Presidency this year is “Human Dignity and Humanistic Values.” Why did I choose this of all themes? I came upon the theme of human dignity gradually, but when it arrived, it announced itself with great clarity as a theme in need of laser-like focus in our age. Several years ago, I was commissioned to author an encyclopedia article on the history of humanistic psychology. I found this task to be more difficult than I had originally anticipated it would be. I fell victim to the worst writer’s block I’d endured in quite a awhile, and spent some days staring blankly at the screen for what seemed like hours at a time. I was determined to say something original about the history of humanistic psychology, and this required extensive investigation. In retrospect, I believe my writer’s block was an incubation period. I had a vague sense of a story untold about the historical origins of humanistic psychology, and while my intuition picked up on the scent and was chasing it with great enthusiasm, I couldn’t quite grab it by the tail. The moment of clarity occurred when I finally arrived at an organizing insight into the structure of the article. As is typical in my research investigations, it came as a result of serendipity. In celebration of Martin Luther King, Jr. Day that same year, I had begun to post quotations of Dr. King on my Facebook wall. This exercise led me to a deeper investigation into his life and his philosophy, which took me back to his dissertation—a theological study of Paul Tillich and Henry Nelson Wieman. At that moment, I became aware that King had completed his doctorate in the Department of Theology at Boston University. I discovered that King had been greatly influenced by a popular theory of social ethics of the time called “personalism.” This was a relatively new term to me. At about the same time, in my investigations of the early history of humanistic psychology, I found that a major common influence on the framers of humanistic theory was the figure of Harvard professor and celebrated champion of personality theory, Gordon Allport. Allport was at the first meeting of humanistic psychologists, and was cited as a common influence by Maslow, Rogers, and others. When I looked more deeply into the work of Allport, I discovered to my delight that he had not completed a dissertation in psychology, as I had assumed. In fact, he’d completed his dissertation in Europe on the subject of social ethics, and his dissertation was directed by and informed by William Stern, one of the major figures in the development of ethical personalism—the same theory that was such an influence on Dr. King. I dug a little deeper, and was floored when I found at that, in fact, Gordon Allport had been involved in regular meetings with Border Parker Browne and Edgar Sheffield Brightman, the Boston University theologians, in which they engaged in hearty dialogues on personalist ethics, and their relevance to the contemporary world. I have not yet found solid evidence that Dr. King participated in these conversations with Allport and his professors at Boston University, but surely the spirit of these dialogues were at the very least part of the background that formed Dr. King’s own social ethics, which became the foundation for his now famous and celebrated social activism during the 1960’s Civil Rights Movement until his untimely death when he was assassinated in cold blood. King was also directly influenced by Gordon Allport in particular through his work on prejudice. Allport’s (1979) book The Nature of Prejudice was cited both by King and Malcolm X. These connections had deep meaning for me, in part, because my dissertation director, Michael Sipiora, had completed his dissertation with Robert Romanyshyn, who in turn completed a dissertation under Rolf Von Eckartsberg. And Dr. Von Eckartsberg received his doctorate at Harvard University under the dissertation chairmanship of, you guessed it, Gordon Allport. And then to discover the connection to Dr. King made oh so much sense, because in a powerful yet intuitive sense, I’d always felt a deep kinship with King, whose philosophy of non-violence and agape love is one I have come to believe more profoundly with age and experience. Also, along with Louis Hoffman and others in SHP, I was becoming increasingly focused on the importance of the value of diversity in humanistic psychology and how this needed to be addressed in a concrete way because, despite lip service to diversity, the Society had long been lacking in racial and gender diversity in its leadership. And this was something we were determined to change for the better. So when I came upon the connection between Allport, King, and humanistic psychology, I felt like I was in the family basement and I just discovered a secret stash of treasure I’d never known was there. What is this personalism? How did it inform the work of Allport and King, and what, if any, influence did this social ethical view have on the fundamental tenets of humanistic psychology? In Gordon Allport’s (1937) influential book, Pattern and Growth in Personality, he interpreted the fragmentation of personality in our age as a cultural problem and identified positivism as a symptom of this larger cultural trend. He saw the reductionism of positivism as part of a larger mechanistic worldview that threatened to purge the world of meaning through a process of disenchantment. Personalism as a philosophical point of view, as well as existentialism, play a vital role in his conceptualization of a remedy. He saw personalism as rooted in the phenomenological tradition, as being congruent with William James’ vision of psychology, and as founding the science of psychology on the concept of the person and personality. For this reason, Allport felt that while nomothetic methods of investigation are important in the science of psychology, idiographic methods must also be utilized because the fundamental unit of the person is worthy of investigation alone. Thus, Allport, through his existential and phenomenologically grounded personalist viewpoint, was an early champion of qualitative inquiry. All of this will sound very familiar to anyone who knows the basic tenets of humanistic psychology. It is important to emphasize that personalism was an ethical theory before it was translated by Allport into a psychology of personality and growth, or what we now call “humanistic psychology.” The central organizing principle of personalist ethics is the notion of human dignity. This ethical conception of human dignity is emphasized in the ethics of Immanuel Kant who distinguished between price and dignity. Whereas something that has a price can be exchanged for something else of equal value, that which has dignity cannot be exchanged because it has no equivalent (Williams, 2005). A person is different from a thing, because whereas most things have a price, a person has dignity. To say that a person has dignity, in this Kantian sense, is to say each person has the intrinsic right to be treated as an end in him- or herself rather than merely a means to our own ends. To treat persons as ends in themselves, for Kant, was a moral imperative that was a bedrock principle guiding all of ethics. With the influence of Edmund Husserl’s phenomenology and the existential thought of figures such as Martin Heidegger, Kant’s notion of the person was translated by Max Scheler into an existential and phenomenological personalism. Scheler’s (1973) work argued that ethics and values were rooted not in abstract, cognitive principles, but in our lived and mooded understanding of values as they are revealed through feelings. This key idea is a major assumption behind humanistic approaches to therapy, such as Carl Rogers’s person-centered approach and Gendlin’s focusing approach, which put their trust in the intrinsic wisdom of felt senses. Scheler’s work also had a direct and major impact on Viktor Frankl’s theory of logotherapy (Henckmann, 2005). 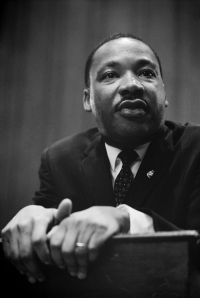 Ethical personalism, along with the inspiration of Gandhi’s non-violent philosophy of Satyagraha, understood within the Christian context of agape love, was the impetus behind Dr. King’s approach to social activism and cultural transformation. King used the term “somebodyness” as a friendlier way to express the key concept of dignity in his public speeches (Burrow, 2002). Every person is somebody who is sacred and in possession of infinite worth, and each person’s destiny is tied to every other person, according to King. He saw each of us as tied together in what he called “a single garment of destiny” (cited in Burrow, 2002, p. 231). This idea cuts between the false dichotomy of individual versus collectivism, because each person is always already related to others and shares dignity with others, which is on the one hand in the service of the common good, yet a common good, ultimately, that should strive to serve each person’s fundamental needs. Humanistic psychology has always been known for its willingness to speak out in ways that cut against the grain of the mainstream voices in the field of psychology. In times when positivist psychology asserts a (faulty) claim that a naturalistic fallacy prevents scientists from speaking on ethical matters, humanistic psychology refuses to quit a speaking that articulates the reasons of the heart. Humanistic psychology is one of the few, and perhaps only places in our field for a legitimate discourse on values, including social justice. We can see now why this is the case. There is an ethical calling in humanistic psychology that not only seeks to heal people through one-on-one individual psychotherapy, or even in group psychotherapy, but that has within its sights a vision of what King called “the beloved community,” where each person is called to serve the others within a tapestry of mutual positive regard, or agape love. It’s not just a vision of an approach to therapy, nor merely an intellectual project to articulate a sound theory, but an ethical call to a different kind of being with one another that we understand intuitively and in a deeply emotional way to be the right way to be, even though, often, we are socialized to ignore this deep-seated truth crying out from our bones. To be a humanistic psychologist is to adopt that faith that, as Dr. King held, “the universe bends toward justice.” (King, 1986). Allport, G. W. (1961). Pattern and growth in personality. New York: Holt, Rinehart & Winston. Allport, G. W. (1979). The nature of prejudice: 25th anniversary edition. New York: Basic Books. Burrow, R. Jr. (2002). Martin Luther King, Jr.’s doctrine of human dignity. The Western Journal of Black Studies, 26(4), 228-239. Henckmann, W. (2005). “Geistige person’ bei Viktor Frankl und Max Scheler (pp. 149-162). In D. Batthyany & O. Zsok (Eds. ), Viktor Frankl und philosophie. Vienna: Springer. King, M. L., Jr. (1986). A testament of hope: The essential writings and speeches of Martin Luther King Jr. New York: Harper. Scheler, M. (1973). Formalism in ethics and non-formal ethics of values: A new aettempt toward the foundation of an ethical personalism. (M.S. Frings & R.L. Funk, Trans.). Evanston: Northwestern University Press. Williams, T. D. (2005). Who is my neighbor? Personalism and the foundations of human rights. Washington, DC: The Catholic University of America Press.